Gold to the Grave, for the Dragon Season has come! The Dragon Choir is broken, new prophecies emerge and the rebellion hangs in the balance. Dragons hunt our heroes and crooked villains plot the return of an evil to make even the gods falter. Secrets are revealed and the key to everything spins on a brutal wheel of death. Rebels and pirates make landfall after an impossible victory at sea. The armada is shattered, but the Council of Jando holds the frontier towns with an iron fist. Calimska raises the magical Golden Shield and an army of dragons begin a war to enslave Oranica under a tyrant King. Are the companions strong enough to survive what immortals fear? Return to all your favourite heroes and villains in Blood Monsoon! Intelligent storytelling will teleport you into a rich and expansive world of magic where two powerful cultures collide in a deadly dance of politics and espionage. Both must contend with the seasonal migration of dragons lusting for gold and a rebellion gnawing for an end to slavery. Sword and sorcery explode from the pages on an epic scale following the exploits of a young man with a bounty on his head, a beautiful assassin who keeps her secrets close and a feisty rebel general with a plan to topple his oppressors. Prophecy has brought them together, but will the Dragon Choir tear them apart? The Dragon Choir series is a fantasy romp of epic proportions with ferocious battles on land, at sea and on the backs of mighty dragons. If you like edge-of-your-seat action, complex characters and a plot with twists and turns in a captivating world, you’ll love Benjamin Descovich’s magical series of books. 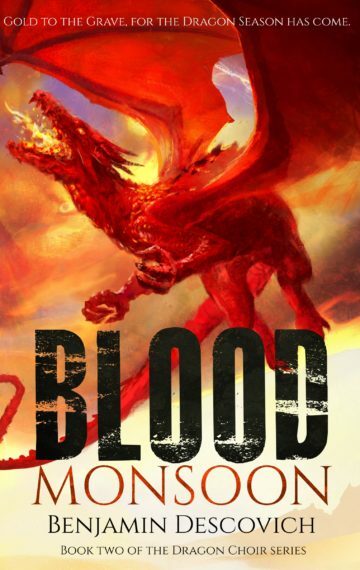 Buy Blood Monsoon to enter a world of adventure and sorcery today!